This design, though simple in the long run, took quite a bit of thought and experimentation to get right. Images on the Web were many and varied; no two seemed to have been constructed in the same way. Drawing a heart is simple enough, as is drawing a Trinity Knot: the trick was putting them together coherently. First, draw the Trinity Knot. Next, construct the heart around it. Make circles the size of the inner and outer arcs of the knot, and line them up with the upper arcs of the knot. Make squares the same diameter as the circles, rotate them 45 degrees, and line them up with the circles so they form a heart shape. Remove the extra interior lines, leaving hearts. The Trinity Knot is already lined up in your heart. Actually my very first CafePress design, this has gone through many versions, some of which I will no longer admit to having made . This has proved to be one of my more popular designs, after several false starts. I love this design because it lends itself to many different interpretations and permutations. 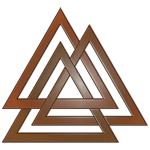 Instructions for drawing an open-centered Trinity Knot with an Annulet can be found here. While many people draw the knot resting on two legs, I prefer it standing on one. 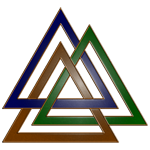 Other Trinity Knot designs are in the works.